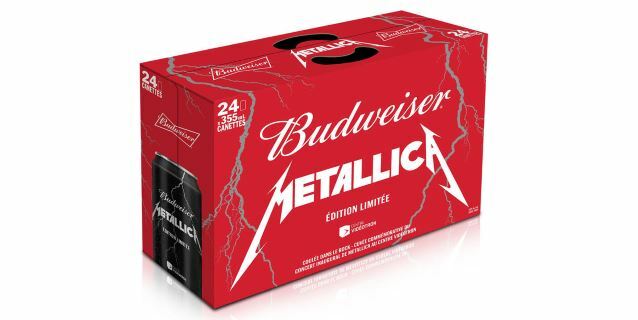 According to Le Journal de Québec, METALLICA has teamed up with Labatt to produce a limited-edition run of METALLICA-branded beer. 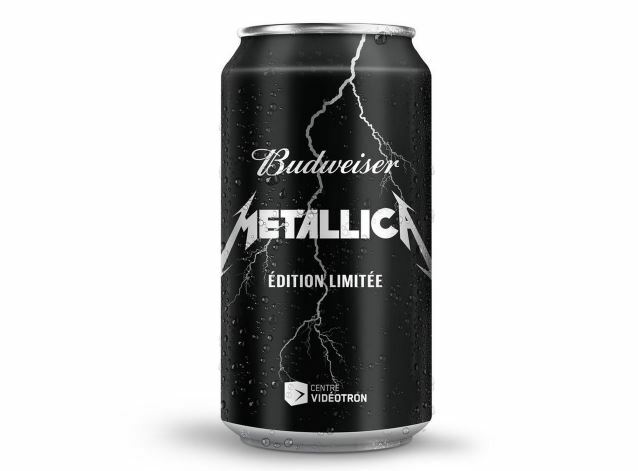 The beer will be made will be made available on September 28 as a tie-in promotion for METALLICA ushering out the legendary Colisée Pepsi and opening the brand new Centre Vidéotron by playing two shows in Quebec City on September 14 and September 16. On Wednesday, September 16, a tanker truck filled with Budweiser will be parked in front of the Centre Vidéotron. Once the METALLICA show is finished, the tanker filled will head to the Labatt plant in LaSalle, near Montreal. The beer will be available in cans, coming in cases of 15 and 24. More than 91,000 black cans will be on the market to mark the historic transition from METALLICA in the new amphitheater. "We are very pleased that the guys in METALLICA are participating in this unique partnership that marks the history of the Centre Vidéotron," said Labatt spokesman Jean Gagnon. METALLICA currently has two dates on its calendar between now and end of September: one show in Quebec City, Canada and an appearance at the Rock In Rio festival. The band has reportedly been working on its tenth studio album, which will follow up 2008's "Death Magnetic". Despite insisting that work has been proceeding on a new CD, METALLICA has spent a lot of time outside the studio in the last year, with activities that included a string of European all-request shows last summer, a week-long residency on "The Late Show With Craig Ferguson", and a Rock In Rio USA stint. METALLICA has not revealed when it plans to begin recording or tentatively release the new album.